So, right now, in this very moment, we’d like to invite you to reflect on the laborious process and lengthy journey that those tasty, life-giving beans endure. From seedlings tended to in a nursery, to a ripe red cherries expertly plucked and processed, carefully stored and shipped across oceans. The many hands, many moons, and many miles involved to get the coffee stateside. And that’s just the start! 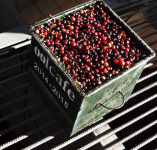 A coffee guru lovingly roasts those green guys into something delightfully drinkable, and packages them just so to preserve the flavor as long as possible. Then, finally, it’s yours. Perhaps, like me, you find the long, laborious journey that coffee takes to get to you humbling, and want to introduce care and expertise to your role in it. Or, you simply have an interest in knowing the inside scoop (pun intended) on keeping and preparing your coffee so it’s as fresh and tasty as can be! Either way, read on. As you may have gleaned, freshness starts with your friendly neighborhood roaster (hey, that’s us!). Coffee is a perishable good, so, fresh coffee equals good coffee. Coffee flavor peaks mere days after being roasted, and definitely should be consumed within a month of its roast date. Does the coffee you buy have a “best by” date as opposed to a “roasted on” date? Buyer beware! This can be totally arbitrary and result in purchasing a coffee that’s stale—lacking the aroma and depth of its formerly fresh self. In addition to the roasting, how a coffee is packaged makes a huge difference. 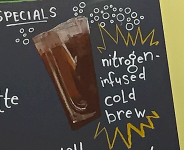 If your coffee is vacuum-sealed, it was likely aged before being packaged – this is because coffee releases CO2 gas after being roasted (in a vacuum-sealed bag, well, it would go ka-boom!). One-way valve-sealed packaging is the way to go, as it lets gas from fresh coffee out, but no oxygen in. And what about the beans themselves? Do you buy them pre-ground or whole? Pre-ground coffee loses its freshness much faster, given that more surface area is exposed to oxygen and moisture, elements that are none-too-kind to coffee. Some coffee folk say that pre-ground coffee starts losing its freshness within 30 minutes of being ground! Compare that to whole bean, which will stay fresh for nearly a month. Your local roaster will likely grind your coffee beans for you if you don’t want to invest in a home grinder. Grinding your beans at home, however, is not only a great way to tell if your coffee is fresh or not (if the coffee aroma fills the kitchen as you grind the coffee, it’s fresh. If not, it’s stale! ), but it allows for you to properly calibrate the fineness of the grind needed for your particular brewing method(s), and to get the freshest possible coffee. We recommend getting a grinder that uses burrs rather than blades, because burr grinding produces more uniform coffee particles, and improves the quality of flavor extraction you get from your grounds when you brew. Here in the café, we sell the Rocky Rancilio Grinder, which, unlike many home grinders has replaceable burrs. It’s ideal for espresso, but can be set to accommodate a full range of brewing methods. We also carry the Bodum Bistro Grinder which, conversely, is not ideal for espresso but accommodates all other brewing methods. Furthermore, this grinder crushes beans between stainless steel conical burrs rather than slicing them. 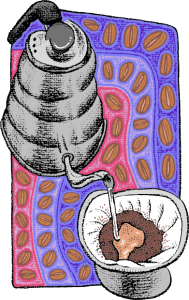 This preserves the bean’s intrinsic flavor and aroma while providing a consistent grind. Whether you buy pre-ground or whole bean, how you store your coffee is an important aspect to maintaining freshness as well. Again, light, oxygen, and moisture are enemies of coffee! If you can’t keep your coffee stored in a pantry, make sure it’s in an opaque container. And, regardless, air-tight storage is ideal. We also don’t recommend freezing your coffee. Thawing and refreezing coffee can cause freezer burn, affecting flavor. If you have a lot of coffee on-hand and and want to keep vibrant for as long as you can, make sure to divide it into pre-portioned bags before putting it away in the freezer. This way, you’re taking the coffee out of the freezer just once! Finally, when is the last time you cleaned your coffee gear? Coffee oils can build up on your equipment, and minerals from hard water can form scale deposits that can affect how your equipment functions. We carry coffee equipment cleaning products in our cafe. If you are curious about what cleaning your gear needs, come chat with us! We know you love (or at least need) your morning cup o’ joe, and would like to invite you to consider the preparation and storing of the stuff to be as much a part of your daily ritual as brewing and drinking it. Our coffee is a labor of love from around the world, and its journey ends in your hands! «Zingerman’s Celebrates 37 Years! Happy Birthday Deli!